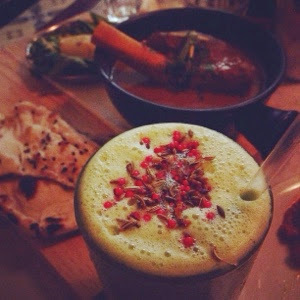 I visited Dishoom King's Cross on the first night of their soft launch, and boy I'm so glad we went early as the restaurant soon become heaving with people. Situated in a restored Victorian industrial building that was formerly a railway transit shed built in 1850, for 100 years it passed goods between Britain and its empire, and between London and Bombay. Small details such as sepia photographs, bench toilette seats and room fragrance have been painstakingly selected to give a genuine Bombay atmosphere to this historic building. Upon arrival we were shown to The Permit Room, a basement bar, where we enjoyed spectacular cocktails. 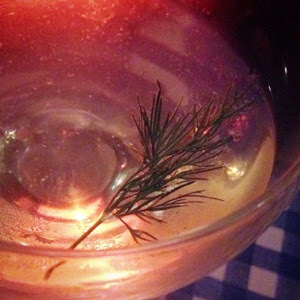 The East Indian Gimlet was my favourite, which once upon a time given to sailors to avoid scurvy. It contains celery bitters, lime and gin. Taken upstairs to our table, we overlooked a private seating area that was home to an impressive wooden table large enough to seat 16. A friendly waiter talked us through the menu and made recommendations. 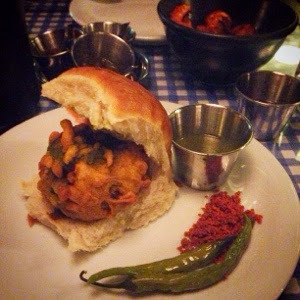 I decided to order the Vada Pau, Bombay's version of a chip butty, to start. The red Ghati masala served with this dish really packed a punch! I'm not one who handles spice well, so was apprehensive. However, one thing this restaurant taught me is that it is possible to have a dish that is both hot and tasty. I returned to the restaurant again last weekend and ordered a selection of starters. 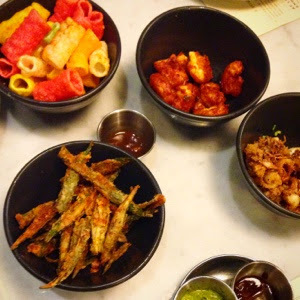 I'd recommend the crispy Prawn Koliwada which is served with a sweet date chutney and the Dishoom Calamari, which has a closely guarded secret recipe. 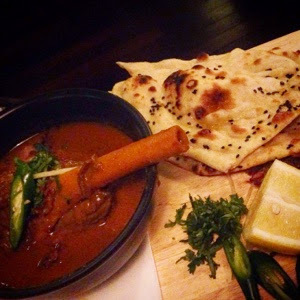 For main course on both occasions I ordered the Nalli Nihari, a lamb on the bone stew with generous spice (for protection against faintness of the heart). For more taste and power, lambs brains can be served alongside - unfortunately they had sold out on both evenings. I also ordered a side of House Black Dahl, which is simmered for 24 hours, and a bowl of creamy Raita. The dish that stood out the most for me is the Mattar Paneer, which you can find on any good Indian roadside restaurant (so they say). It is packed with vegetables to give texture, which contrasts beautifully with the soft cheese. Utterly unforgettable.